Hard fescue is indeed one of the "hardiest" of the fescues. Shade and drought resistant, and more disease resistant this fescue grows best in the north and the higher elevations and is more drought tolerant than chewings fescue. Hard fescue has blue-green color, and can grow in some of the most adverse of conditions including heavily shaded areas. Known for its clump formations, hard fescue may not be mown as low as the other fescues. Hard fescue is one grass that stays green a longer period of time, is slow growing and a low maintenance grass. Varieties of hard fescue are being developed for extended usage and acceptability as lawn grasses. This fescue makes an ideal conservation, erosion, and reclamation planting option in areas not easily maintained, but still has adequate rainfall during the growing season. 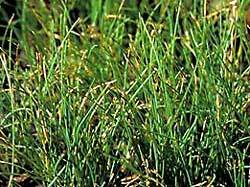 Hard fescue is a cool-season grass often used in cool-season grass seed mixtures when shade is an expected problem. It does well on low fertility soils and in shaded areas. This species is good as a non-mowed turf for slopes, median strips, and nonused areas of parks. In fact, where rainfall is not an issue, hard fescue is an excellent grass for soil protection and retention. However, it does not recover well from severe injury and is not tolerant of high summer temperatures. Left unmowed, this no-mow lawn will form a soft, 4" - 6" tall carpet of grass. If you prefer a more cropped look, mow once a month to a height of 3" - 4". Never remove more than one-third of the top growth; cutting lower may damage the grasses. Water only during dry periods—occasional thorough soakings are better than frequent light sprinklings. Fertilizer is not necessary. Grubs, leaf spot, dollar spot, summer patch and red thread are potential problems for hard fescue.